If you haven't already installed the virtual COM port driver, do this first. 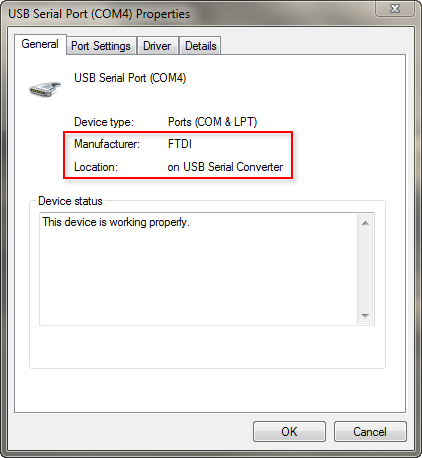 The virtual COM port driver can be downloaded from the FTDI web site. To right on the row for Windows is an option "available as a setup executable". Click the "setup executable" link. This will download a zip file (e.g. CDM21226_Setup.zip). Once the file is downloaded, unzip the file and run the installer (e.g. CDM21226_Setup.exe). Ensure the USB cable is connected to both your PC and the amplifier. Also verify the amplifier is plugged into the mains (so the microcontroller in the amp is powered). The virtual COM port will not appear in Windows Device Manager if these two conditions aren't met. Then click the Advanced... button. 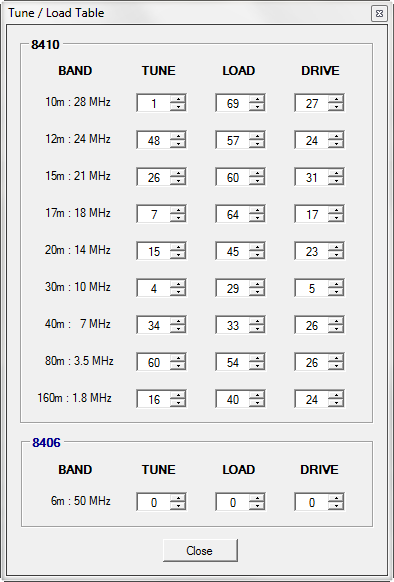 Make sure your parameters look like this (for your FTDI COM port number):. This is the most important step. 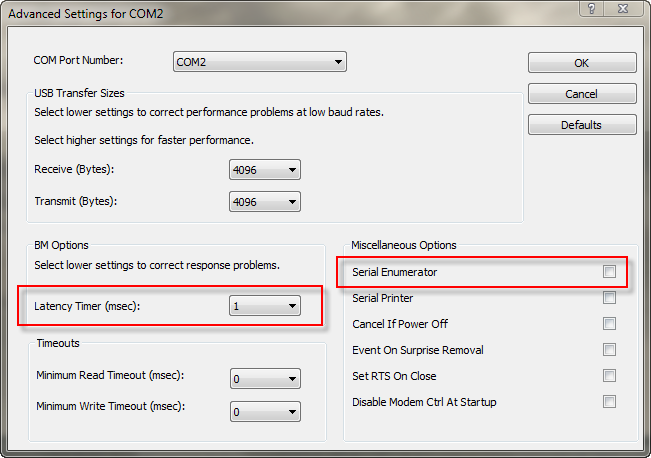 If the latency timer and serial enumerator are not configured correctly the monitor will appear to lag the amplifier significantly. These two parameters represent 95% of all support inquiries. 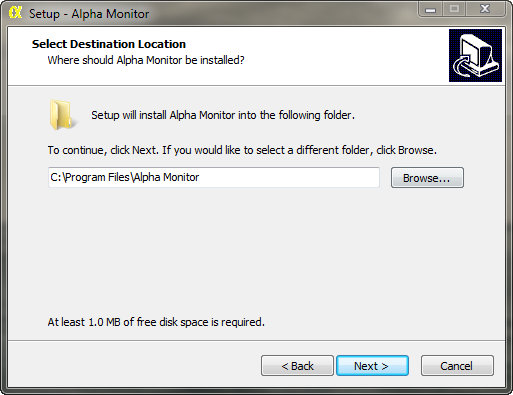 Download the monitor and unzip to a temporary directory. The monitor can be downloaded here. 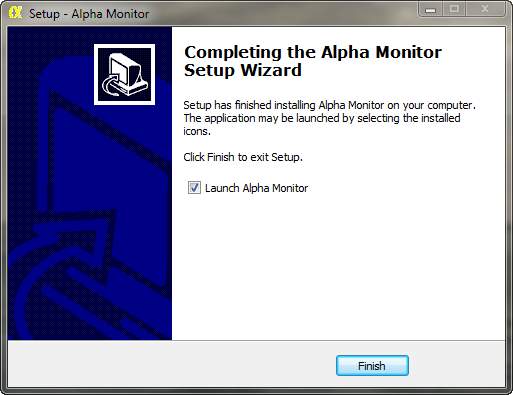 Once unzipped to a temporary directory, run the installer (Alpha Monitor 1.6.0, for example). Click 'I accept the agreement' and click Next. Choose your Start Menu folder or opt to not create one (I recommend you do as there will be an uninstaller stored there as well). Choose whether to create desktop icon and a quick launch icon then click Next. Confirm your choices and click Next to continue with the installation. Set your COM port. Use the COM port number found in step 2. If you wish to have your telemetry logged to a file, specify the file here by clicking the button with the ellipsis to the right of the log file field. Next, select whether logging to file should be enabled. Normally, this is enabled selectively since the file grows quickly at the 6 Hz polling rate or the 10 Hz streaming mode rate. Select whether the monitor should stay on top of other programs. Select whether you want the monitor to warn you when you change the band switch on the 8410 that you should tune for the new band. 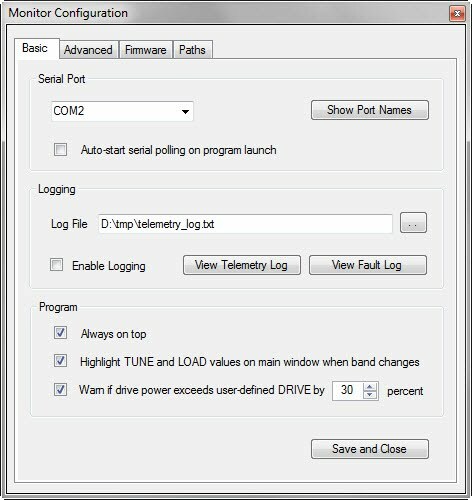 Select whether you want the monitor to warn if measured drive power exceeds the drive power you define in the Tune/Load table by a given percentage. Use of the Advanced tab is optional. 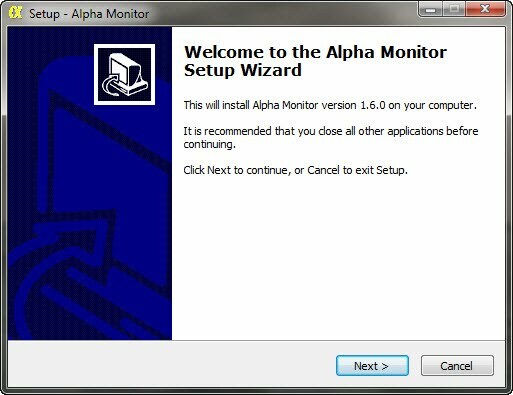 If you've directly measured your plate voltage and found it to be reported differently via telemetry, you can configure the monitor to apply a correction factor here. Just supply the directly measured and corresponding telemetry-reported plate voltage and the ratio will be applied to future plate voltage telemetry values. If you haven't replaced the HV metering resistors yet, skip this step as there isn't a linear relationship between the two with the old (brown) resistors. 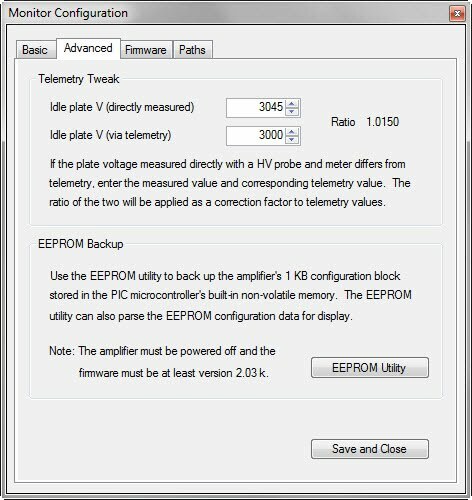 Also on the Advanced tab you can launch the EEPROM utility that allows you to make a back up copy of your amp's configuration stored in non-volatile memory. The utility can also parse the configuration into engineering units. Use of the Firmware tab is also optional. 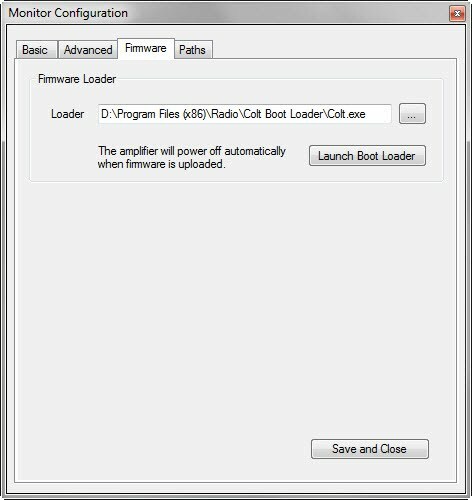 Use this to specify the location to RF Concepts' Colt boot loader - a utility that you download from RF Concepts that provides a means to upgrade/downgrade the amplifier's firmware. 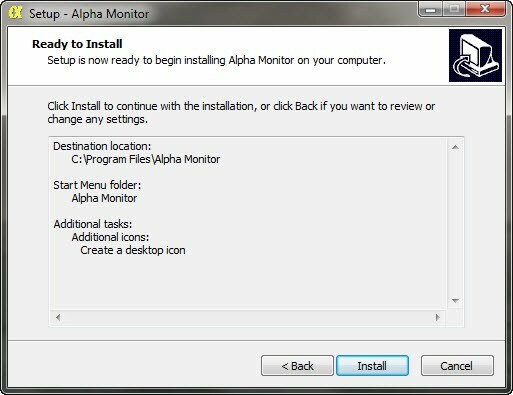 By launching the Colt boot loader through the monitor, you need not remember where the Colt executable is each time you need to perform an upgrade, nor do you need to remember to stop the monitor so the COM port is available for the boot loader. Back on the main window, click Tune / Load Table and enter the data from your paper tune / load / drive chart. The purpose of this is to eliminate that paper chart and it allows the monitor to tell you the Tune, Load and Drive values for each band as you change the band switch. You're ready to go. Just click Start and the monitor will start communications with the amplifier.